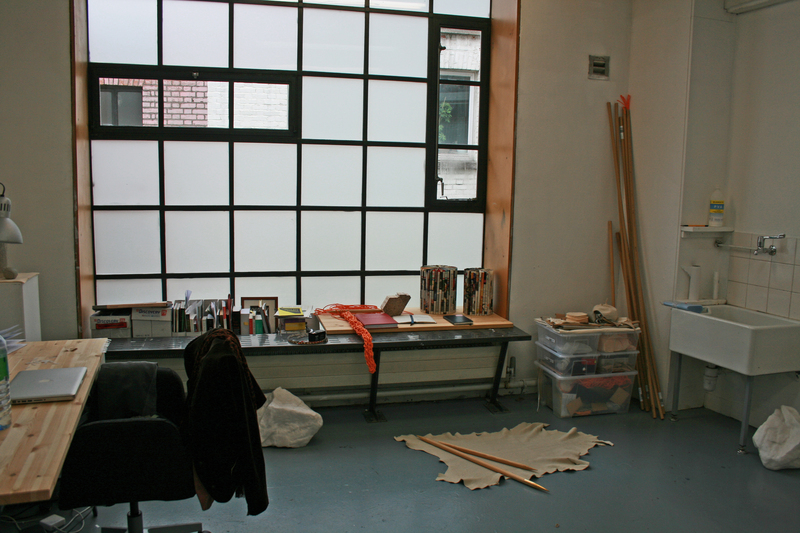 Barbara Knezevic currently has a 6-month project studio at Temple Bar Gallery and Studios in Dublin. She is not a medium specific artist but a lot of her practice is manifest through sculptural and installation works. In her artist’s statement Barbara says that her sculptural works consider “existence and its fleeting nature”. When I asked her about this she said that she feels this is a summary of the way she works rather than being applicable to all her sculptures, because depending on the materials she is using, there are shifts in the way she responds to them. One of her past works involved latex balloons filled with helium. In this case the work was literally fleeting or temporary as the sculpture itself was time-based. The helium seeped out of the balloons while they were in the gallery space, causing them to deflate. She feels some of her works are fleeting or unstable “in the way meaning is constructed” as opposed to being physically fleeting as the balloons were. She is always looking for the point where meaning becomes corrupted, or slips or changes in some way. She questions the existence of meaning throughout her work. Barbara does not necessarily have a methodology to the way she works. She says that because the materials she uses are so diverse, one thing she has learnt is that she has had to become very adaptive with new skills and techniques. From moulding leather to sewing, she says that the internet has been a great resource for her in terms of learning these kinds of practical things. The best way she said she could describe the way she works was by describing the process of how she arrives at the final object. 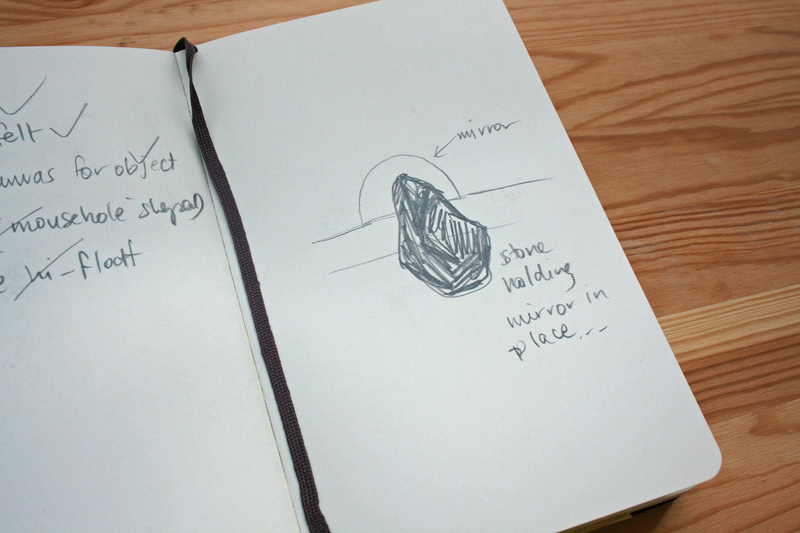 When Barbara is struck by an idea she sketches it into her notebook. 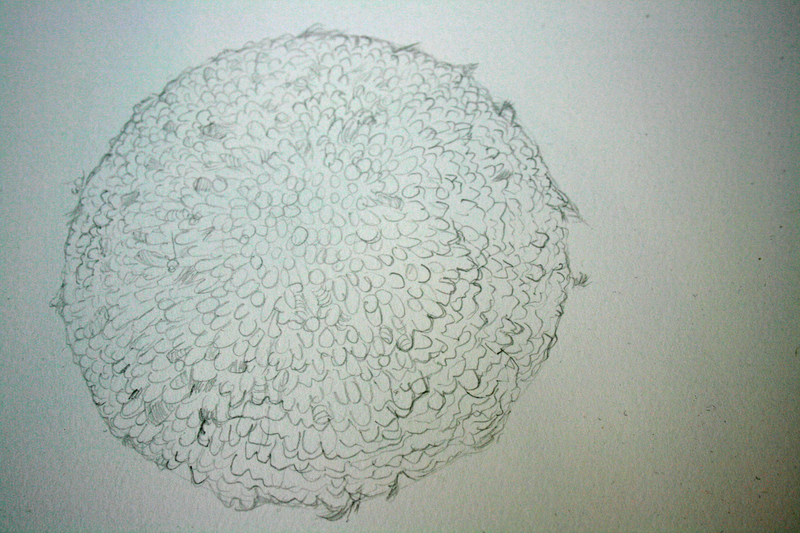 It starts with some rudimentary drawings, not meant to be especially aesthetic, and unfolds from there. Barbara explains that she gets to a point where, when something doesn’t exist in the format she wants it to, by force of will she makes it happen. After the basic drawings are made she will make some more accomplished drawings and from there she will progress to the sculpture or installation. The drawings made throughout this process are not for exhibition, they are simply part of the process Barbara works through. Barbara occasionally makes text-based work. However she said that she absolutely resists making works about texts or theories. 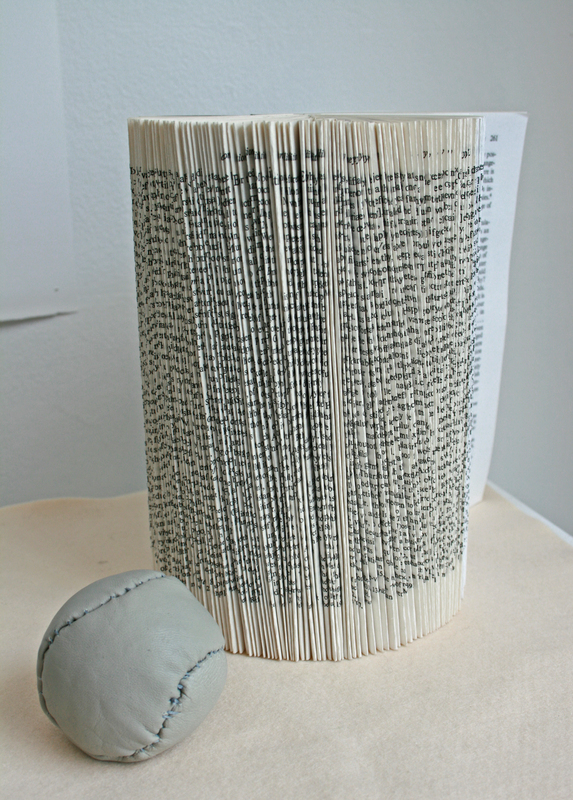 The way in which she utilises texts through her work is by playing with them in various ways. The work she makes brings to the fore an idea that also uses the text in some other way. A recent text-based work Barbara made is Breath: an exercise in omission. This consists of 200 photocopied pages of a one page description and analysis of Kenneth Tynan’s production of Samuel Backett’s play Breath, with which Beckett was very unhappy. Barbara was interested in the fact that Beckett chose to omit this play from his overall life’s work and through her work she considered how meaning and value are corrupted by interpretation. It is compelling to see how the words of the first page are gradually omitted as you turn through the photocopied pages in the book. Barbara frequently reads art journals and texts to keep up to date with current ideas and art practices. She reads journals like Frieze, Cabinet and the e-flux journal as well as many online journals. She also told me that she was particularly interested in Boris Groys’ article, Politics of Installation, where he discusses how the status of the exhibition space changes from a public to a private space in accordance with the individual artist’s design of it. Barbara has an exhibition coming up in September so she is focused on making work for that now. She was hesitant to talk too much about specific works for the upcoming exhibition because she says that if they don’t exist yet, it feels like she is sucking the energy out of them before they have a chance. She did tell me that she is working on one big piece as well as a work incorporating moulded leather, an on-going pencil structure and some text-based work. She has taken Karl Marx’s book Capital and is folding each individual page. It is a long process and is something she will have to do in instalments because she says it’s too consuming to do over a long time. It is the book completely unaltered except that the pages have been folded. 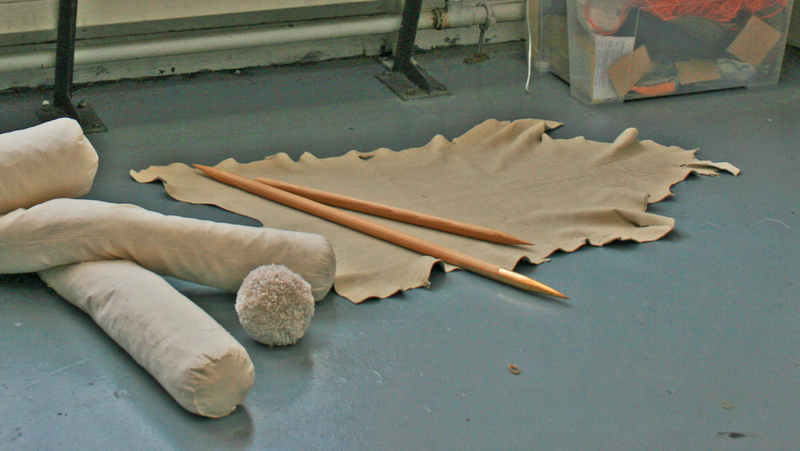 Barbara uses a wide variety of materials for her work – wool, balloons, umbrellas, wood, rocks. I was curious as to how she selects the materials she works with. She says that she is coming to realise that she chooses materials that have in some way already been ‘produced’. For example, the wood she uses in some of her works is mass produced in order to be made into broom sticks. 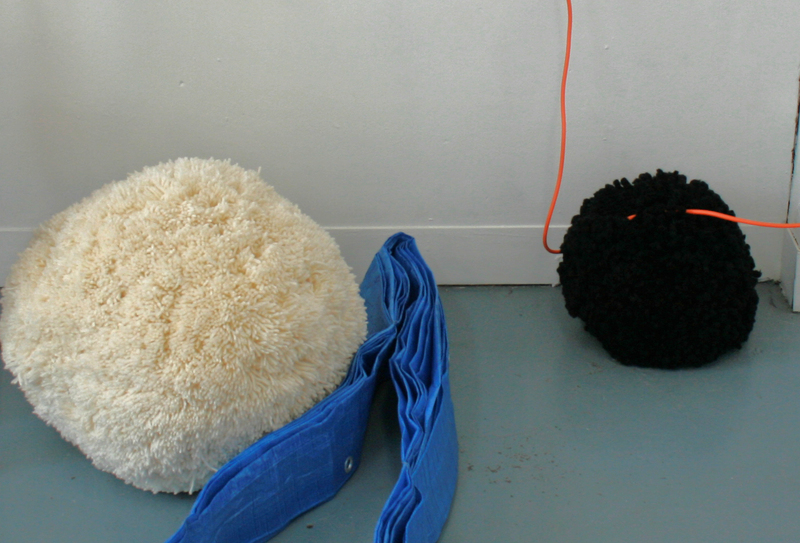 The wool used in other works was already intended for a particular use before Barbara re-interpreted it. She says what is emerging to her is that she is selecting things that are already in circulation for a different purpose. Barbara is interested in how value and meaning are constructed through objects. This leads her to taking an object that is already in circulation culturally and seeing how “revising it or changing it slightly can cause the meaning to change”. She refers to the broomsticks as an example. She says they are very basic objects, they are mass produced pieces of wood and are available anywhere around the world. Barbara has simply whittled down the end and it is this action that changes the object and has removed it from its original purpose. She is not interested in changing the structure or the form radically; she has made minimal intervention. This is how Barbara refers to value and meaning in her work – she says there is the thought of “how little do I have to do to this before it is changed? It’s trying to find that point and not go beyond it”. The idea of the labour that has previously gone into these objects interests her too. They are usually mass produced by people or by machines and her doing something to them, however small, changes its value. It continues to be a mass produced object but now has another value, so it becomes an art object. It’s the ‘handmade fashion’ of the intervention that attracts Barbara to this work. This concept leads us to what is central in Barbara’s practice – the act of intervention and the ability to alter the value and meaning of an object.